Dedicated to promoting healthy, sustainable, & kind living. 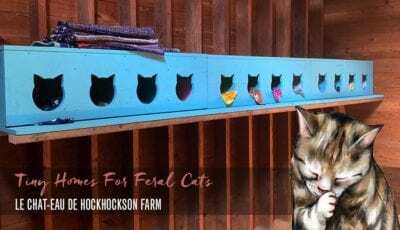 Located on 45 historical acres, the Hockhockson Farm Foundation is home to an animal sanctuary and local vegetable and flower farm. The foundation rescues farm animals through its affiliation with Farm Sanctuary’s Farm Animal Adoption Network (FAAN). If you are looking to place a farm animal or to learn more about the Hockhockson Farm Foundation, visit our FAQs page. As animal lovers, we can always do and be more for those who depend on us. When we make changes in our lives — whether big or small — that move us toward seeking compassion for others, we are moving in the right direction. I believe anything is possible and change can happen in the world when we as individuals live by our beliefs and let kindness be our inspiration. Remember to Do Unto Animals when you’re Doing Unto Others! I’ve learned more often than not, the rescued animal is the human, and the rescuer usually has four legs (or sometimes 3, or wings, or fins…you get the picture). Eliza loves love -- she won’t seek it out but look her in the eye and stroke her cheek, her tail will wag fast and she’s all yours. Described as “a lot of sheeple’s best friend. ", she’s incredibly maternal. Barry and Lucas adore her and Frankie will seek her out to snuggle and rest on her head on her back. No matter how old Lucas is, he’ll always be our baby boy. He’s super-duper sweet and cuuuuuute! He looks like an angel and his looks don’t deceive. He’s so gentle and never even went through his head-butting phase. He loves connection and to be pet and, like many others, he adores Eliza. We adore him! You’d never know by meeting young-spirited Sneakers that he’s 32 yrs. old --99+ yrs. for us humans! His favorite activities include rolling in the grass and then rolling in the grass some more, running, puzzle toys and watching the mini horses like he’s watching TV! The ladies love this sweet old man! Ally is our little shy girl. With her friend Anita by her side-- she is calm, gentle and content. While hesitant around people at first once you earn her trust, she’ll show you her goofy side. When she’s not hanging with Anita in the pasture she’s flirting with Sneakers. Anita is an angel! We love to kiss her sweet little nose and get tickled by her soft whiskers. Having only one eye doesn’t keep Anita from keeping an eye on everything. She's observant and sensitive. She and Ally adore each other. When they run together it's like synchronized swimming on land. Nugget is a super sweet boy, often mistaken for a plush toy. He loves to rile everyone for play. His best bud is Sneakers. His girlfriend is Panda (a therapy horse from Mini Horse Heroes that he shares a paddock with). This little Romeo will call out to his Juliet and she will happily run to him. Jill, our Director of Shelter and Rescue, says Gromit is one of the sweetest angels she’s ever met and she’s met a lot of angels! Look his way and he’ll roll over in a puddle of love to get a belly rub. He runs, spins, and plays bows just like a puppy. Bossy to his sis, he’s a mush to everyone else. Always on the go, Veronique prefers to be out rooting in the pasture way past her bedtime. While she appreciates a good belly rub, she won’t commit too long (#FOMO). She likes to nibble on your pants and shoes, and if it slows her down enough to give her some love, we’ll take it. He'll pick up the tiniest strand of straw to add to his bed. “Arthur, it did need that 1 piece.” Buried so deep in his nest, we have to feel around a bit to ensure he’s tucked in for bed. A committed snoozer by night -- super active by day. He’s always rooting for something and we’re rooting for him! Not a morning guy, Wilbur is more the type to hit the snooze button. 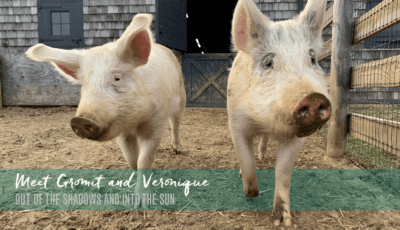 Arthur and Wilbur explore different nooks and crannies during the day. At bedtime though, they report back to each other with the day’s events and snuggle deep inside their nest. The only clue they’re in there is an occasional snort. Luckily for us all when we purchased Hockhockson Farm we got more than we paid for. Their names are Dr. White Pants, Missy Gray, Greg, Tetley, Ernie, Queen Frostine, Steely Dan, Smith, Fleetwood Mac, Kaleidoscope, Marguerite, Malcolm, Mama Aspen, Helen, Hall, and Oates. Levi is a sweet and loving guy--a boss well-respected but not feared. His best friends are caregiver Kat and Avery. He LOVES his winter coat and takes on a bit of bravado when wearing it. He had to be brave to make his escape from a slaughterhouse as he’s a fainter. He’s our superhero! Harper packs a wallop into a small package and a wallop is what you’ll get if you try to push her around. She’s playful gurrrrl but she don’t play. Her hard exterior belies a smushy soft center. Harper LOVES to say hi to everyone and to sunbathe on the jungle gym. We love seeing the sun shine down on her! Avery is very fittingly a Capricorn; soft-hearted and determined. He’s the little brother that torments you because he loves your attention. To be honest we linger a little longer hoping he’ll drive us crazy. Hobbies: Macgyvering toys out of anything and looking for trouble with Levi. Incredibly sweet, tolerant and trusting: He has the cutest freckles on his nose. He loves sneaking up to give hugs. If you don’t give him attention he will paw at you until you oblige. He appreciates a good spa day with soft music and a gentle shearing. Tracey calls him her boy but his soulmate is Eliza. Young Frankie is ALWAYS ready to play. 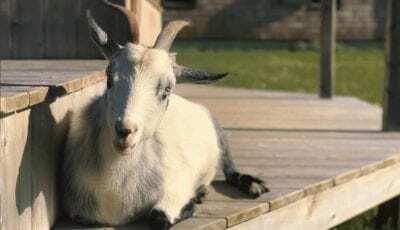 When she gets ram-buctious we tap out and let the goats tap in. Walking away teaches her that’s not how we wish to play--her goat and sheep friends are happy to oblige her. When it’s time for this spirited girl to slow down she loves to snuggle with her gal pal Eliza. Romy is pure innocence. A deep soul, his gaze will melt your heart. He'll come running (actually, pronking!) from any distance if you utter his name. Forever curious, this goofy, social butterfly gets along with everyone who greets his fence line: sheep, goats, pigs, humans, deer, and dogs. Bobby Laurino, a remarkable third generation independent farmer, has been farming for over 40 years and his family has farmed Monmouth County since 1945. As small farms around the country are getting squeezed out by large corporate farms, Bobby gives his heart and soul to whirlwind days of weeding, plowing, planting,cultivating and harvesting. There’s nowhere else he’d rather be than providing a bounty of fresh vegetables and flowers to his community. He serves up loads of generosity as well; donating produce to those in need and providing learning opportunities to children with special needs. We are honored to have him at Hockhockson Farm. Be sure to visit him from May to November at Laurino Farms Farmstand located at 372 County Road in Colts Neck, New Jersey.